When I read about Cat's latest books, both historical books with black male protagonists, I ordered both. I read Freedom back in August, but this was still on pre-order and arrived just before I went on holiday, so I decided to take it on holiday as I had space in the suitcase. I read it in just an hour or so, and really liked it. It's one of the Barrington Stoke books with thick pages that are ideal for uncertain or dyslexic readers, and it also has the most gorgeous illustrations in it that I felt really added to the story. The story is the true story of Matthew Henson, a black American who went on expeditions to the Arctic Circle for years and years of his life, in search of making it to the North Pole. His endeavours weren't recognised at the time because of his colour, although he has been recognised in more recent years. We learn a bit about his childhood and his early life, and a little bit of his life at sea, and then more about his life in the Arctic and the people he met. My only criticism of this book is that it wasn't long enough! 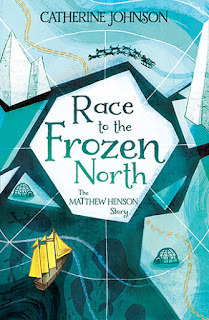 I could have read much more about Matthew's life and I think Cat has such a way of getting across the harsh realities of the lives of people of colour to the younger reader. More of these, please!